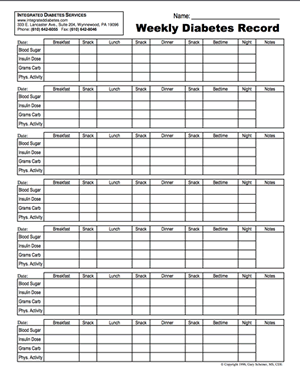 We have a variety of printable logsheets / charts that you can either print or also use in microsoft word or mac pages. 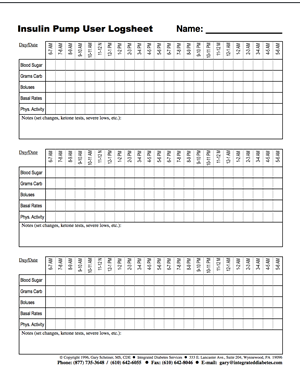 This is an excellent general record keeping logsheet form for those taking multiple doses of insulin. It has 7 days per page which are broken down by meals and snacks. It also includes room for blood sugars, insulin, grams of carbohydrate and physical activity input. This is the same as the weekly logsheet, but the columns are broken down by hour and it includes more area for notes. 3 days per page. A record keeping form for pump users. 3 days on a page, broken down by hours. Includes room for blood sugars, grams of carbohydrate, boluses, basal rates, physical activity and notes. 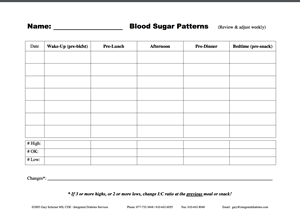 This logsheet is ideal for those with Type 2 diabetes. It includes 6 days per page and space for blood sugars, medication, food and activity input. The gray boxes denote alternating test/recording times in order to capture patterns throughout the day and night. 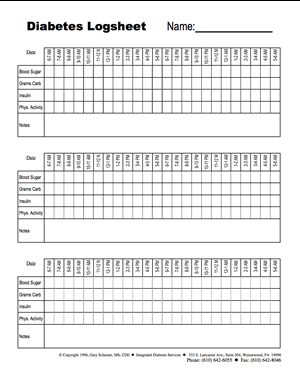 Use this printable weekly logsheet to track your blood sugar patterns by recording your readings before all meals and snacks. Thank you for making these available – saved us a lot of trouble trying to come up with our own or trying to squeeze everything into the tiny diabetes log books. Many researchers feel that cinnamon might help maintain normal levels of blood sugar. How much cinnamon per day? Thank you for the variety of sheets available. Still trying to find what works for me – and I’m hoping I found it! I would like to thank You Very Much.It took 2 hours of researching to find what I was looking For.Thanks Again. Sorry… the most we can do is a week on a page. If you are able to create one that records an entire month and are willing to share it, let me know. We may be able to post it on our website. Interesting, on the monthly log sheet. I keep a monthly calendar on my fridg that I print out from the internet. It’s got really big boxes. You would have to write small, but depending on the data you are collecting it may work. The daily sheets can be burdensome and if just want to have one sheet to document, there you go. Who knows, as you use it, you may feel like you need to graduate to a more detailed formula. 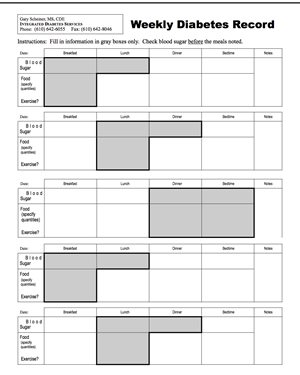 these are great worksheets, I’m looking for these in Spanish as well. Do you have any? Unfortunately, no. Just had my first book translation (Think Like A Pancreas) into Italian, so hopefully we can start working on more multi-lingual projects soon. I need to be able to type all my info into my computer and be able to print it out when needed. I am new to diabetes ( type 1) because of an islet cell transplant. It would just be so much easier if I could just go on my iPad and type it in instead of keeping a hand written log. I am not good with computers. Any suggestions? We recommend the MySugr app. You can enter blood sugars, insulin doses, carb counts, even food notes, activity notes etc. It is easy to use and convenient. I have created a basic bg log sheet for 4 weeks I’m more than willing to share if it can help others! I’m not sure how to share it here though, could someone help me with this?. Feel free to go to our website and download the items you would like at no cost. THANK YOU . I REALLY HATE THAT I HAD TO DOWNLOAD A PAGE, BUT I AN A NEWBIE TYPE II. GOTTA HAVE SOME WAY TO KEEP TRACK OF IT. Omg exactly what I was looking for. I was stressed looking for log books. This just simplified my life. Thank you. Thank You for the variety of schedules. I’m in a new relationship with a type 2 diabetic and trying desperately to understand what he’s going through. I’m hoping with these schedules I will be able to help get him on track. Thank you for these wonderful sheets. Thank you all for the information, this is new to me as well! I have looked for a LOOOOOONG time for extensive training on diabetes and reading charts that I get from Glooko and Dexcom. Finally!!!! Thank yo9u Integrated Diabetes. My life is getting better because of your help. in your inbox! Thanks for visiting! i have used a bank statement book for years as a diabetes log.it works great for me! I thought I was the only person who used those!